We’ve recently published as part of our Land Law Course Newsletter a series of Exam Hints. We thought they might be useful for other courses as well so we’ve opted to make them available here. Remember you can access past exam papers and reports on the VLE – University of London student’s can access them at “Previous Exam Papers and Reports” on the homepage. You can see the points below, or look at the colourful images at the bottom of the page. Poor grammar and spelling: language is the lawyer’s tool and unless you learn to express yourself clearly and unambiguously you are bound to under achieve. Whether English is, or is not, your first language you can still hone your skills before the exam by reading articles and cases whilst listening to English language broadcasts and recordings on TV, radio and the internet. 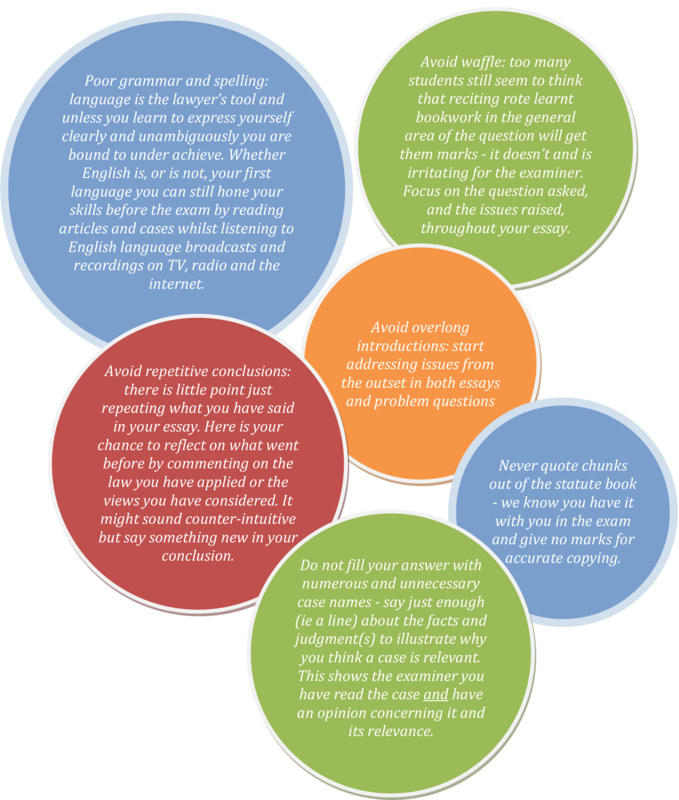 Avoid waffle: too many students still seem to think that reciting rote learnt bookwork in the general area of the question will get them marks – it doesn’t and is irritating for the examiner. Focus on the question asked, and the issues raised, throughout your essay. Avoid repetitive conclusions: there is little point just repeating what you have said in your essay. Here is your chance to reflect on what went before by commenting on the law you have applied or the views you have considered. It might sound counter-intuitive but say something new in your conclusion. Never quote chunks out of the statute book – we know you have it with you in the exam and give no marks for accurate copying. Do not fill your answer with numerous and unnecessary case names – say just enough (ie a line) about the facts and judgment(s) to illustrate why you think a case is relevant. This shows the examiner you have read the case and have an opinion concerning it and its relevance. Avoid ambivalence: both problems and essays are invariably set in the grey areas of the law where alternative arguments exist but that should not prevent you reaching a conclusion after considering the merits of the various approaches and explaining why you favour one over the other(s). Avoid inventing new facts in problems: there is more than enough to say in the exam already and you should be careful not to add to the complexity, although that should not preclude you pointing out where a critical fact has not been revealed and explaining why that is significant. Do not be frightened by ambiguity: a single judgment will often have a number of possible ratios on which jurists might well disagree, whilst those problems multiply where there is more than one judgment in a case. Do not ignore this complexity but make reference to it. The same is even true of statutes, on occasion, and likewise juristic writings – language lacks the precision of mathematics which is why poetry is beautiful and (some) lawyers rich! 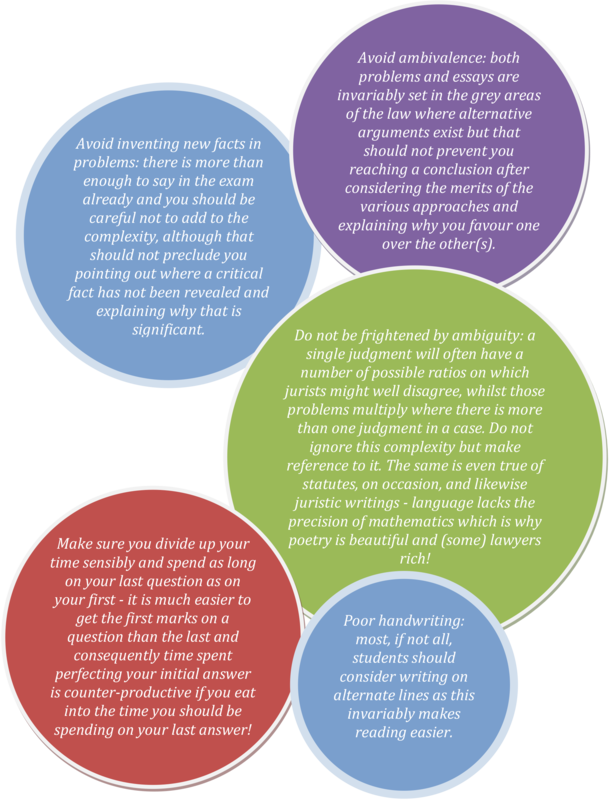 Make sure you divide up your time sensibly and spend as long on your last question as on your first – it is much easier to get the first marks on a question than the last and consequently time spent perfecting your initial answer is counter-productive if you eat into the time you should be spending on your last answer! Poor handwriting: most, if not all, students should consider writing on alternate lines as this invariably makes reading easier. Never question the facts in a problem – nor speculate on whether they can be proved. Think of yourself as a judge sitting in the Court of Appeal writing a judgment that has come to you in case stated form. You are there to apply the law to the given facts, willing to reject first instance decisions, overturn CA precedents and, although nominally bound by HL/SC decisions, still able to criticise or distinguish them. Finally know the law (in so far as it is known), know the arguments (in so far as there is doubt over what the law is or should be) and know what you think – make sure you include your own opinion (although not exclusively and after giving due weight, but not undue deference, to case law and juristic writings). Next Post: We want to hear from you! THIS IS A GOOD INICIATIVE,THANK YOU AM WELL GUIDED,I APPRECIATE. This is great and it will help me now not to stress with quoting several cases verbatim than know the principles. This was very helpful and opened my eyes to new ways (be it correct ways) of writing my essays for exam. Thank you! Sorry Laaiqah but we can’t be specific on other courses. Thanks a lot for this. Most of these helpful points here are also mentioned most of the previous examiners reports. One question here: My impression is that students are told to write on every single line in the exam book rather than every other line in the exam rooms (I’m from HK). But I might be wrong. Anyone can clarify here / prove me wrong? These are the thoughts from one chief examiner – so some are obviously course specific and don’t apply to all courses. I felt some of the tips are suitably generic to be worthwhile for all courses, hence why we shared. Apologies for the confusion. Hi, I’m sorry, is the author serious about writing on alternate lines? This is preferred for all papers? The first line says this is the guidance for Land Law. Each examiner will have their own preferences and so on. This isn’t a new exams policy or regulation – just some guidance / soft skills for people to take on board should they wish. Thank you. The same issue was raised minutes before. Not to worry, this isn’t official guidance – which is why we called it “hints” as we’d worry that people felt this was a new set of regulations. Extremely helpful information. Looking forward to applying it in the examination. I love it. AND this could be THE official guide-lines for LLB. Please help us for implementing this. Already I have started to use the document in every year of LLB. Thanks pat, for your helpful exam tips that will assist the most of the distance learning students including me before going to be seated in the examination. I am expecting some specific useful guideline/exam tips from you on law of trusts and Land law. These are for land law. Please see the newsletter section on the VLE for land law. Thanks very much for those hints. They are helpful but why subheadings in answering an exam question? These hints are the opinions of the land law chief examiner. If you don’t think they apply to other courses please don’t feel obliged to use them – remember you can check past exam reports on the VLE for each course. just in time when I needed it. find these hints extremely helpful. Thanks, this is a very useful and beneficial tool for students in our preparation. This helps to build my confidence as exams approach. Thanks for those tips, but i have a little confusion about subheadings. Should we use them in answers of problem ques. as well? if we should, then how we are supposed to input in answers while we are analyzing factual issues? thanks again. These guidelines are the views of the chief examiner for laws – they might not apply to all exams. I would use your discretion as to which hints to use and when to use them? are we supposed to write complete titles of cases and statutes in our exam? I can’t advise on this, I would suggest looking through the exam reports for your courses and seeing what they say on this issue. Thanks a lot have been finding it difficult to understand the principles guiding the exam.I really appreciatefor putting us through. The guidelines surely be helpful, to open the eyes of the students. Students always want to hear the voice of ‘University of London’ regarding examination tips. Though University of London is providing guidelines continuously but we sometimes overlook it ( For Example in Criminal Law , Examiners Reports of 2011 Zone and B). If we read general remarks/introduction section of each Examiners’ reports of specific subjects (of past exam papers) we will definitely get more tips of examination. Sometime Newsletters also helpful for specific subject’s exam tips (for example Exam Technique of Trust Law, William Swadling , March 2008 newsletter/ available in Newsletters section of trust law). Thanks for the exam tips. It must help us. Waiting for more exam Tips/guidelines. thanks for the tips. I think they are quite helpful. However,I must say throughout my course of study(I’m in my final year) we’ve been consistently told NEVER to introduce anything new in our conclusions but you are saying quite the opposite here. I’m confused! The guidance is primarily for land law, and is provided by the subject convener. It might not apply for all courses, so please take on board other guidance as well. Thanks i really needed this tips, but i have a question when stating the cases is it compulsory to add the date and is it allowed to just paraphrase the cases. I can’t provide official advice for this, but would suggest reading the Past Exam Papers and Reports on the VLE home page for the subjects involved. It’s good i shall also work on it for a successful exams this time. I need to know how long an essay is required in the examination, please. Please read the previous exam reports for guidance on this. THANKS FOR THE GUIDE THEY WERE QUITE INFORMATIVE. Even though I am not writing an exam on Land Law, I think these tips carry some generic information worth applying to all exams and I am grateful for them. Thanks much. I think this guideline will be helpful for us to get good marks in our final exam. This is great stuff. Hope it would really help me this time around in my Criminal Law Exams. Thanks! Thank you for the advice, this is very encouraging and can only help to bring success, please post more of this type of encouragement and guidance. Above information is very helpful! As its with regard to land law ,may i know whether its possible to get the examiner’s report for the 2013 Zone B question paper? Its not available in the VLE. Wealth of information on the vle. Can I get a guidance on how lengthy my answer should be and what is the minimum number of case laws that should be entered into the answer? I just registered this year (2015) as a graduate entry student Route B. Based on everyone’s experience, is it wise to sit exams for June 2016 or june 2017? I am looking to obtain a qualifying law degree. How long is the duration of course studies after registration, do students usually take a full year to study then sit exams after a year, or as in my case, take exams in june 2016 as apposed to 2017? I hope this didn’t confuse anyone. I’m just trying to obtain some clarity. Thanks for you advice in advance.